Engage your students with this exciting group work task. 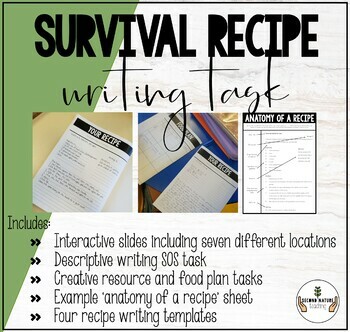 Students will work together to write a descriptive SOS call, research and brainstorm the location in which they are lost and will then work together to create recipes that they could make in a survival situation. A resource that hits many standards (descriptive writing, research, group work, and informative writing), I'm sure it will be a hit in your classroom!